I love my new lights! And the photo cube. Before I priced pieces to send off to Red Dot Gallery on Deer Isle, I took the time to experiment some more with my new photo set up. I love having so much light available at the flick of a switch. What a concept. Translucent Pardo polymer clay, colored with alcohol ink, embedded silver. Stick or plexiglass rod? Which do you think works better? I waffle…. More translucent Pardo with embedments. Same plexiglass rod, but different background colors. Bronze and copper metal clay. Out of the kiln and out of the tumbler. 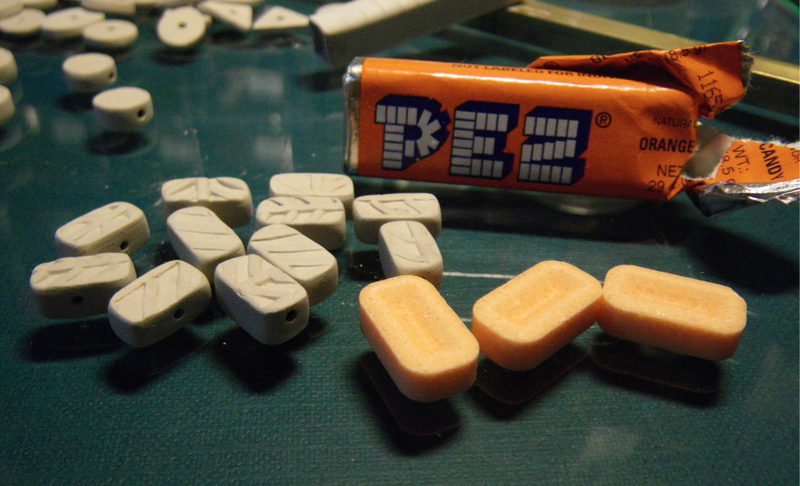 The Pez beads have shrunk about 12%. 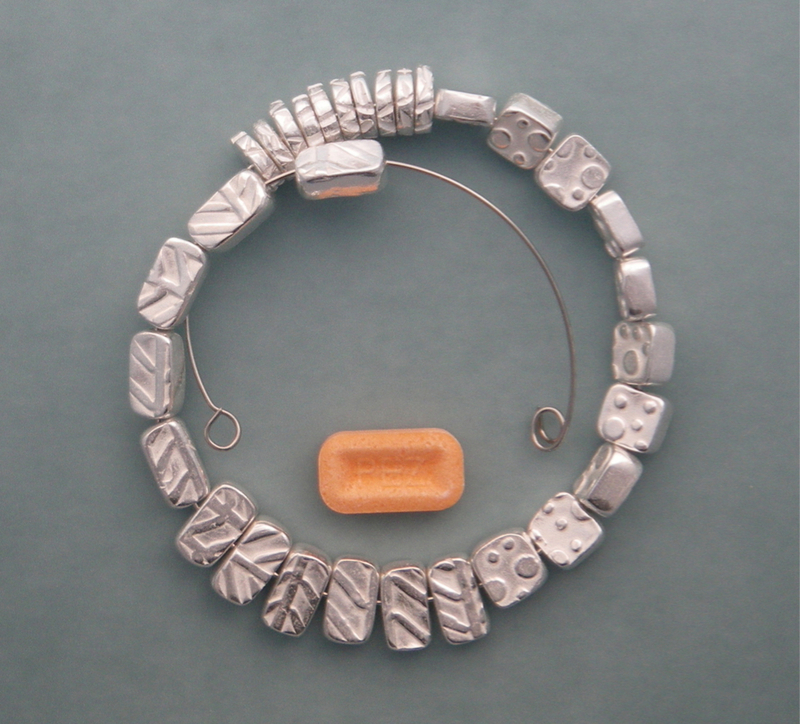 The next step is to oxidize the beads to darken the recessed areas. 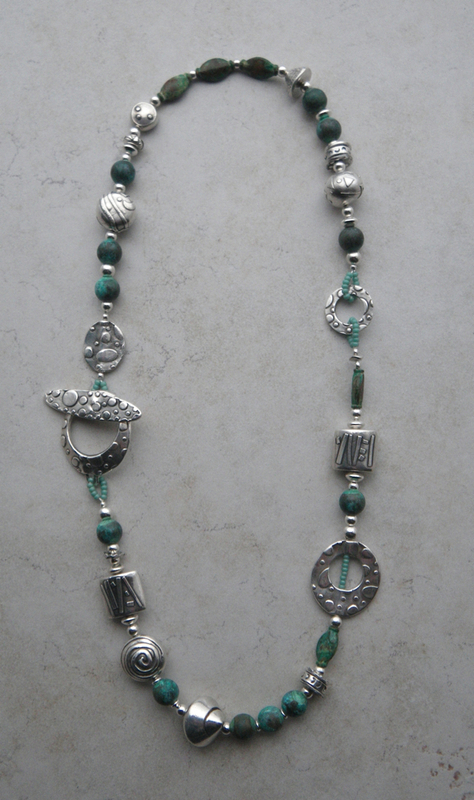 I did not oxidize the heishe beads, since only the edges will show and I want those to be bright. 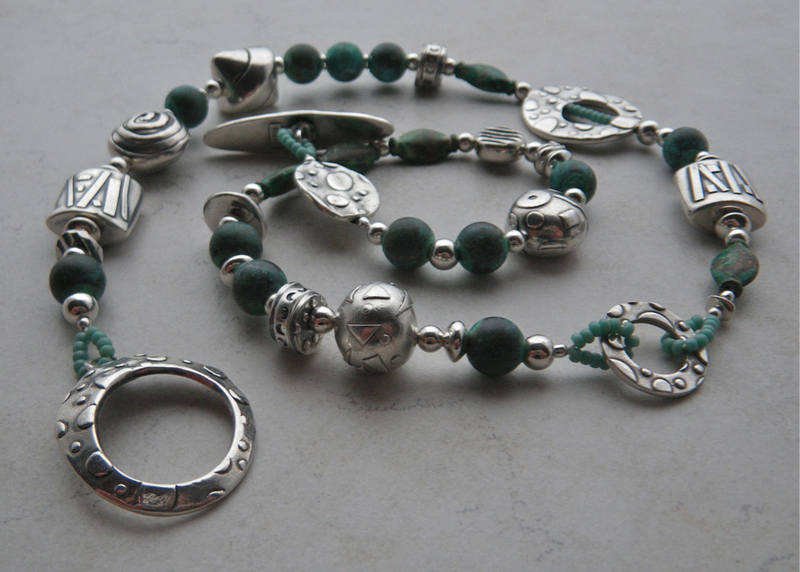 After hand polishing the oxidized beads, the higher areas are bright silver. 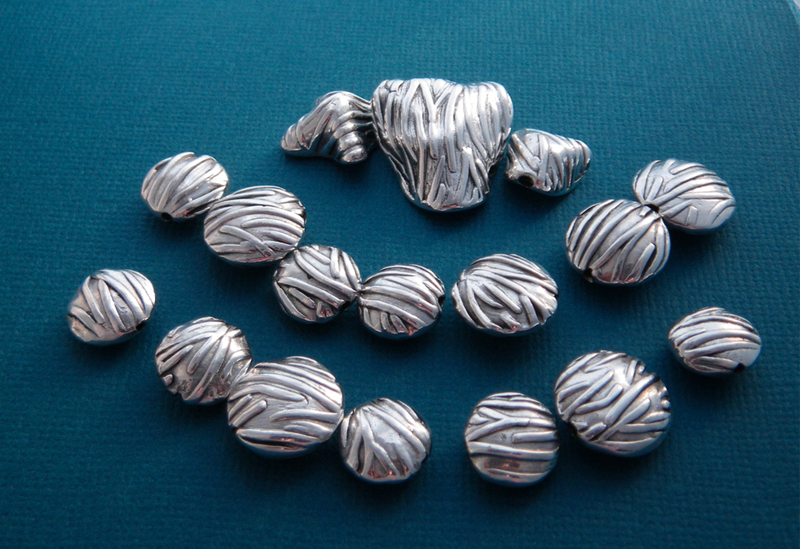 These beads are ready to go! Today was a day I had looked forward to and dreaded. I made PMC beads, using a package of PMC I had purchased at a higher price than I would have paid today. Ah well, I will just have to get used to the up and down of the silver market. Once I let go of worrying about how much it cost, I got to work. It had been a while since I last worked with PMC and I sat down with a blank feeling as to what I would make first. 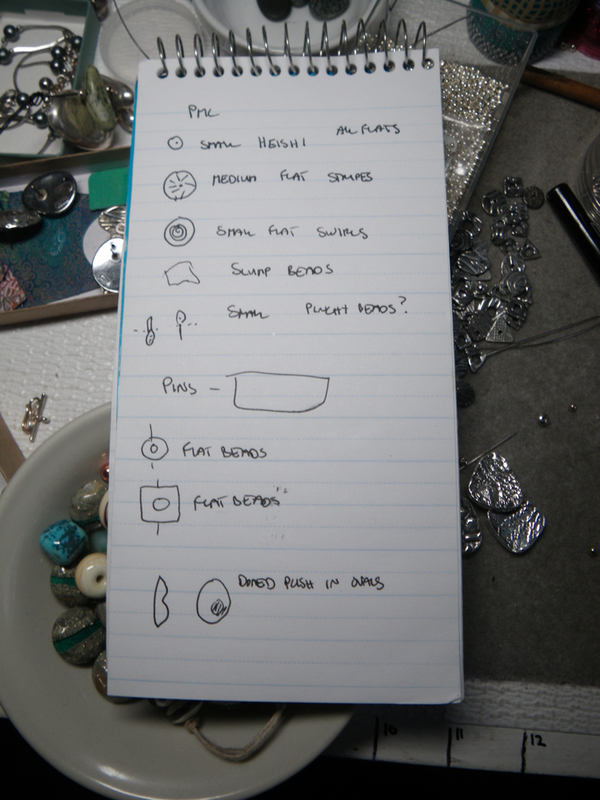 I looked through my sketch book and made a list of the kinds of beads I wanted to make. I started with the beads at the top of my list. 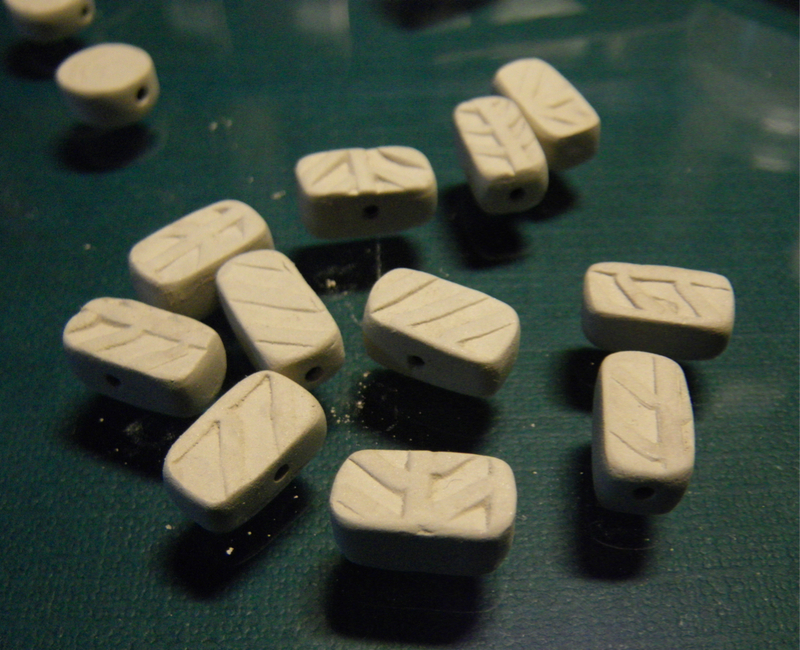 Some flat “heishi” type beads made from my old scrap clay. 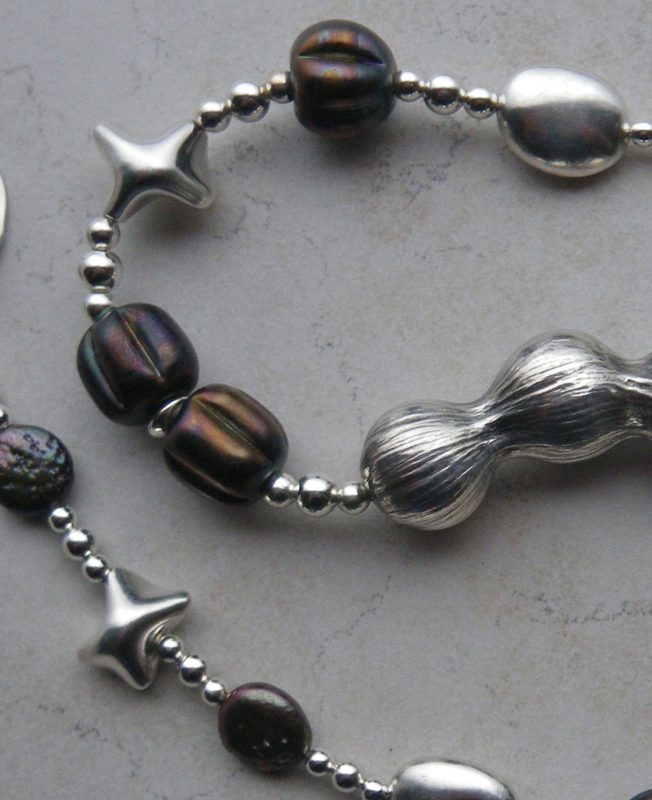 The flat sections won’t show, but the burnished edges will, and they give a nice accent to other beads in a necklace. 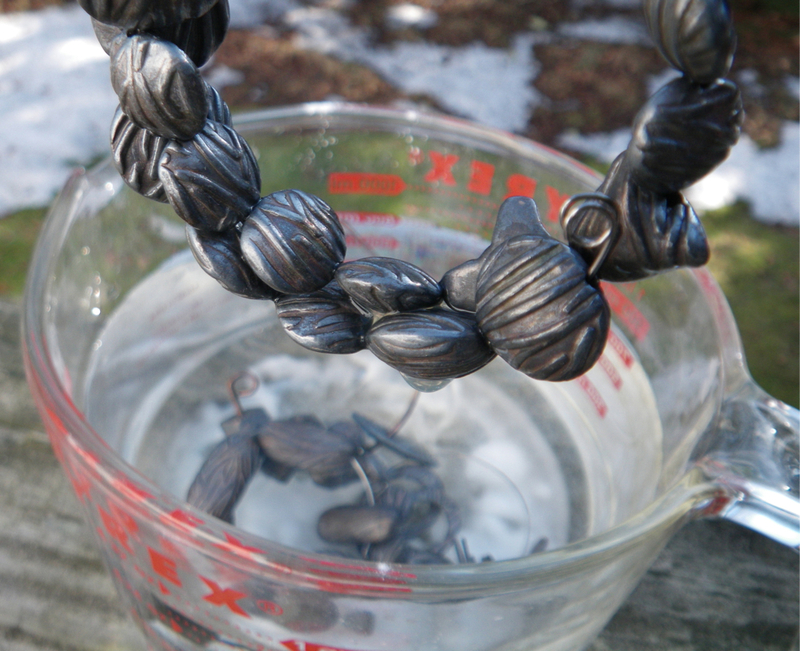 This is my new favorite thing to do with rehydrated dried clay. 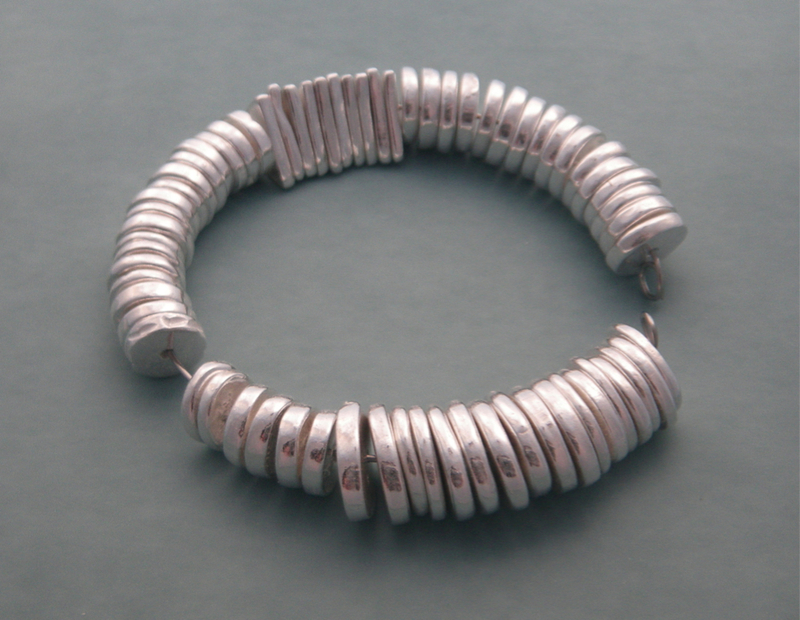 I then left off the list to make some tiny beads to use in some specific necklace designs. 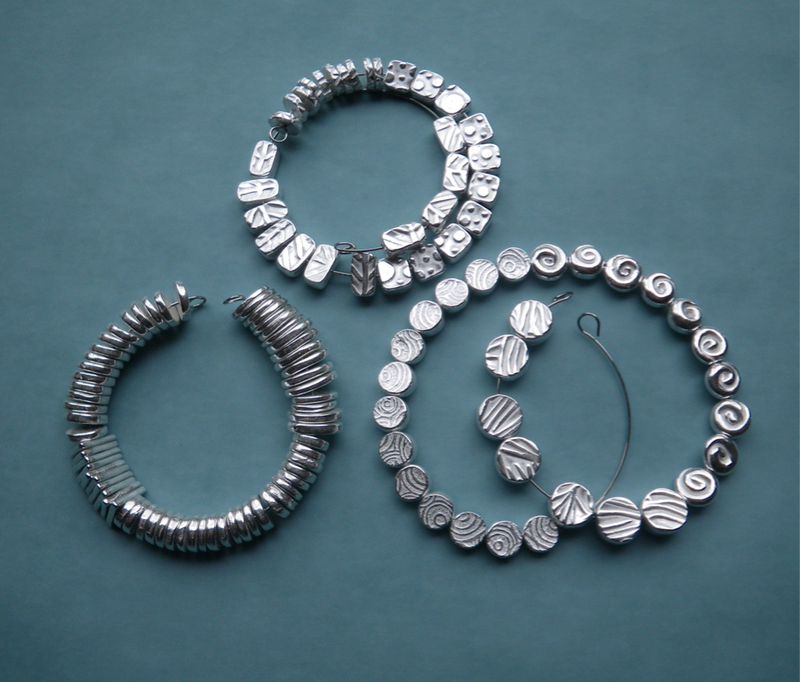 Tomorrow I’ll work on earring components and a few brooch ideas. You can see the flat heishi beads in the background of the photo above. 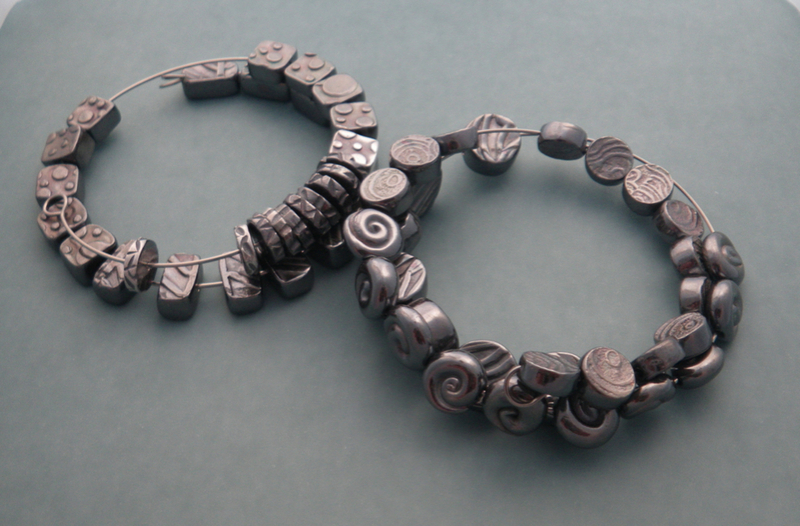 Once I used up my scrap clay, I got going on hollow beads. I made some fat coin shapes (but tiny) and some flat rectangles. The sides are smooth and the tops and bottoms are textured. 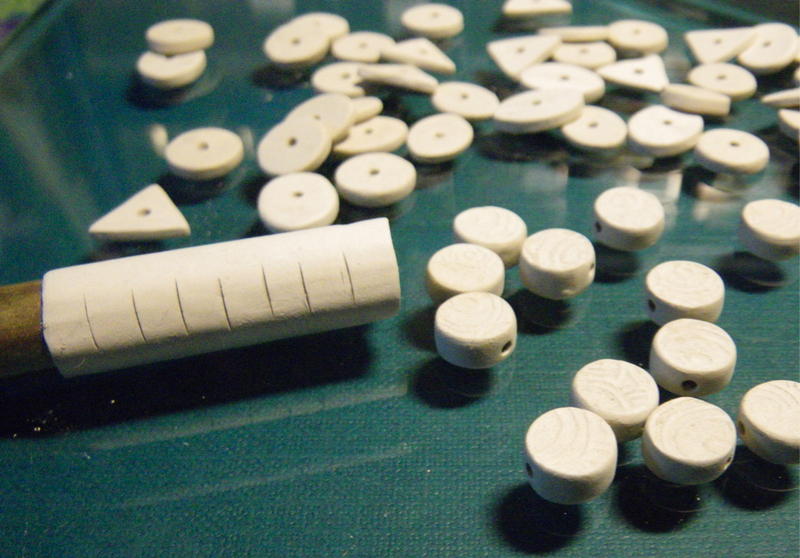 These hollow beads are production pieces. I make a bunch at a time by wrapping a brass tube with metal clay, scoring it to mark off bead sections, drying it on a cup warmer, then sliding the dried tube of clay off the brass tubing. 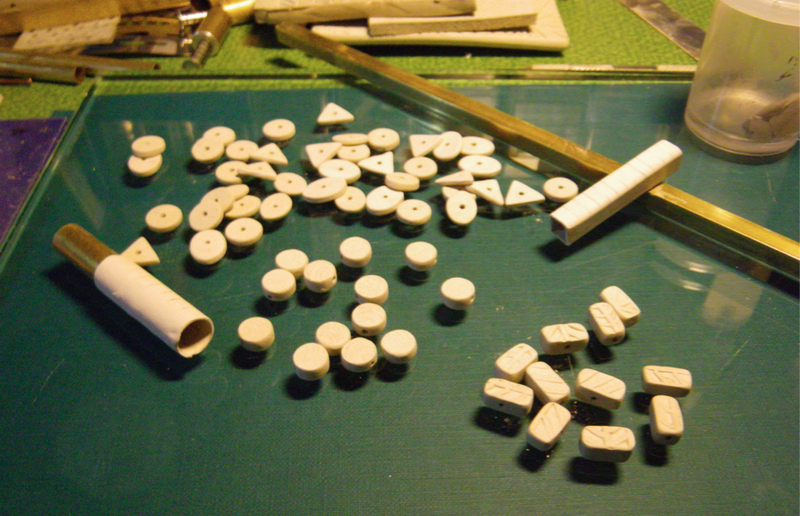 With a jeweler’s saw I cut the bead sections off the clay tube. With just a slight bit of sanding they are ready for the tops and bottoms. I had a rectangular brass tube so I gave that a try for a batch of beads. I drilled some widthwise and some lengthwise. Do these shapes remind you of anything? 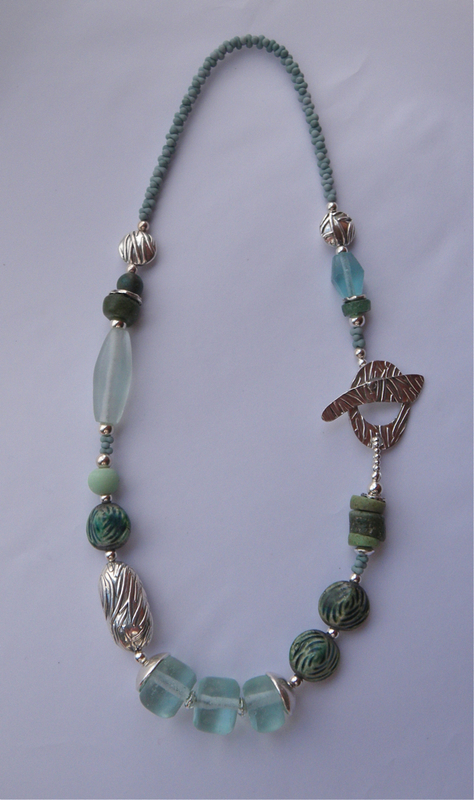 Another of the necklaces I made this week. Another rainy day photograph. 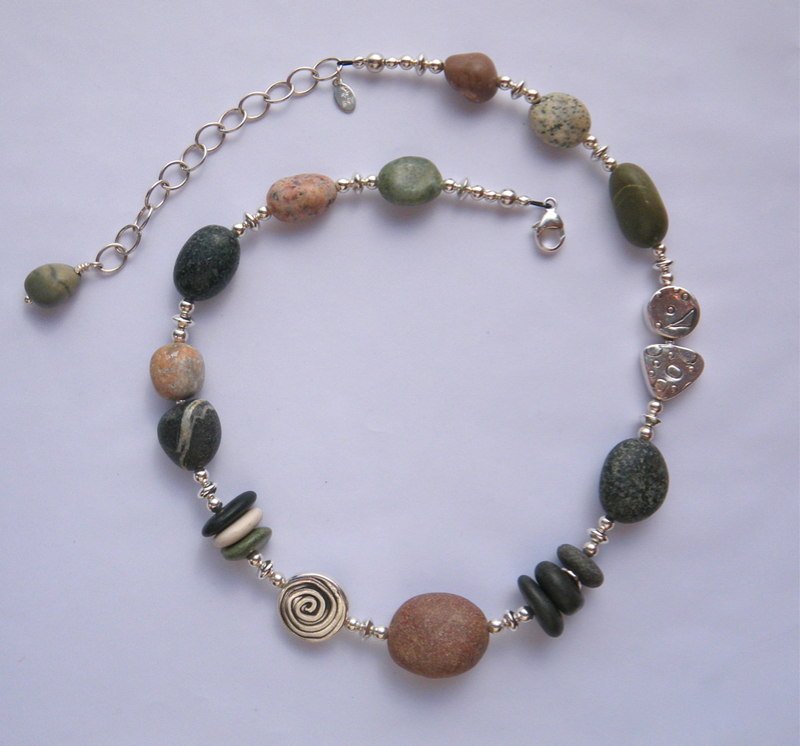 This necklace shows a little history of my bead making with precious metal clay. 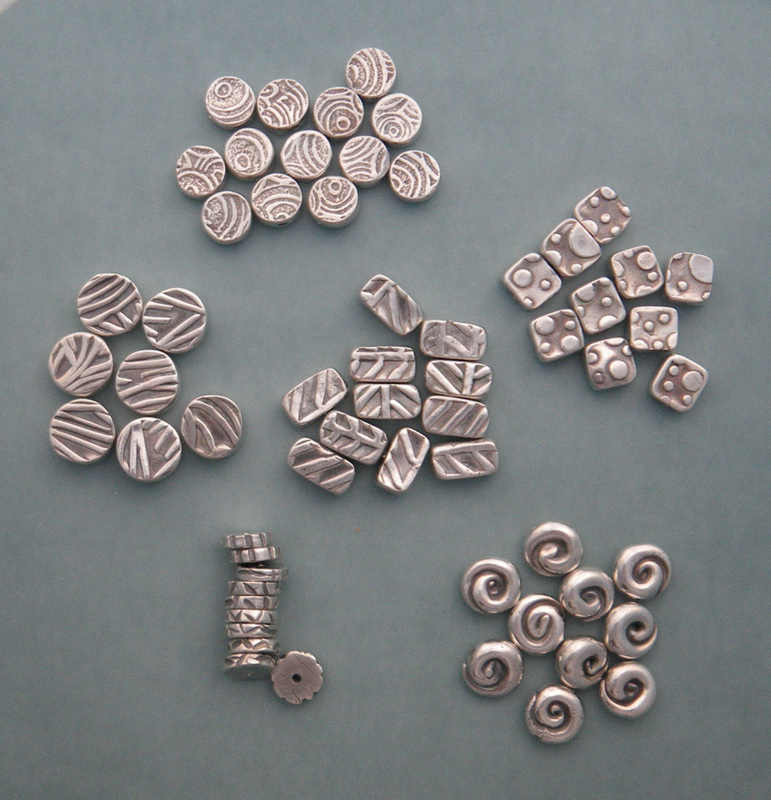 The toggle clasp and washer beads are from this year, and most of the others were made in previous years. 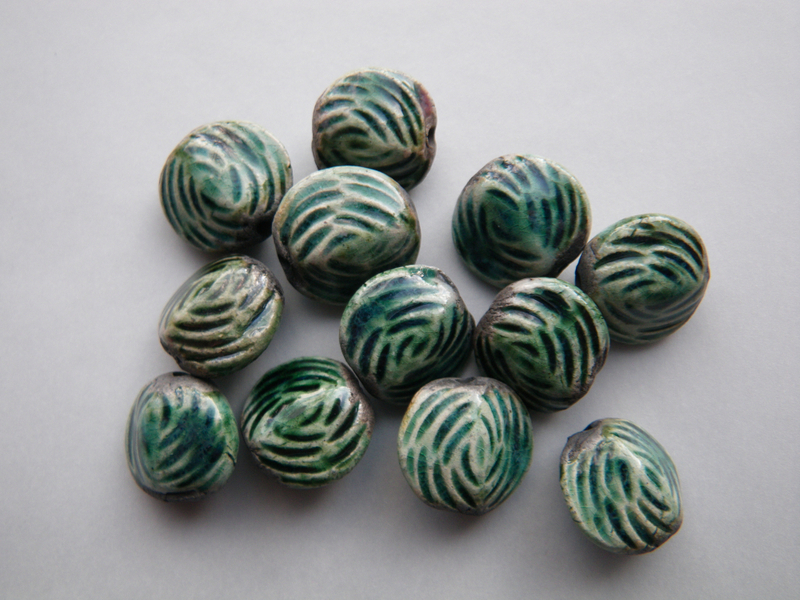 The beautiful round patinated copper beads are from Shannon LeVart of Miss Ficklemedia. 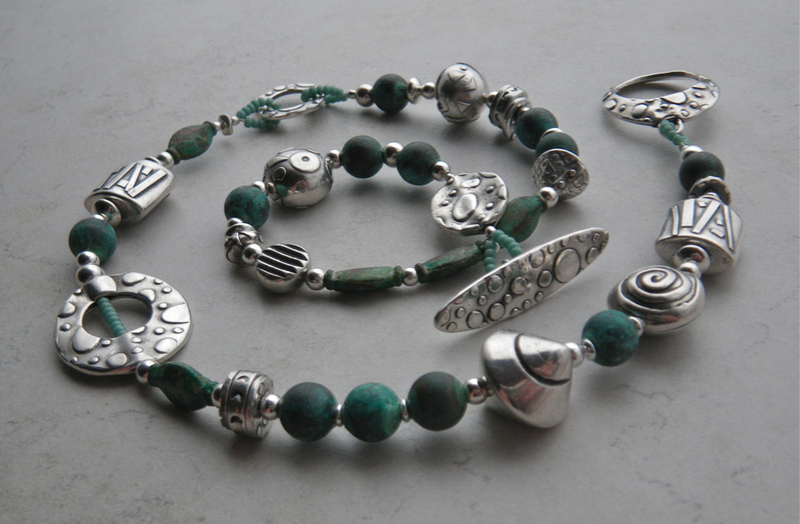 Her range of patinas inspired me to find some of my own copper components to try my hand at patina. 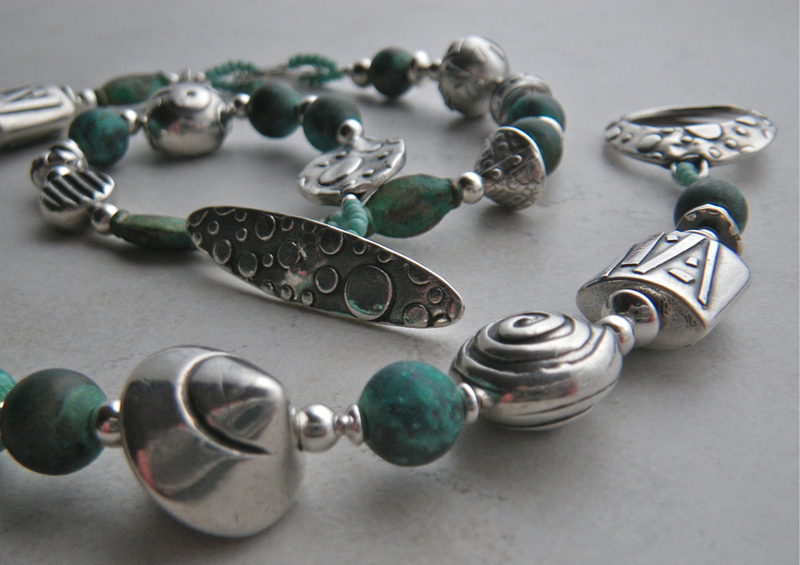 The smaller, flat oval-shaped beads are from my first attempts with Shannon’s Verdigris patina. 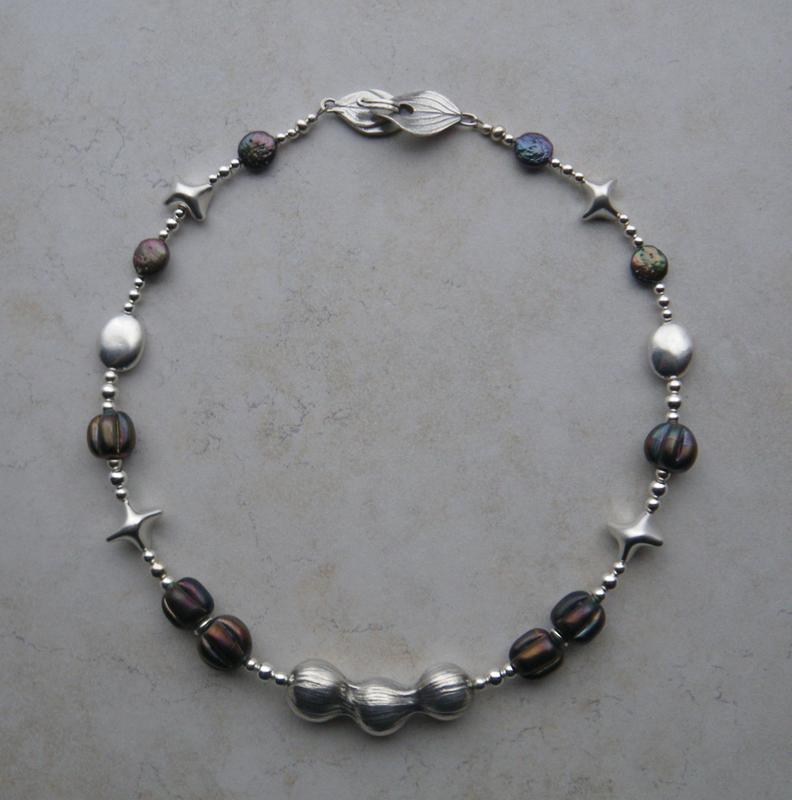 There are beads in this necklace that were formed over a Cheerio core. 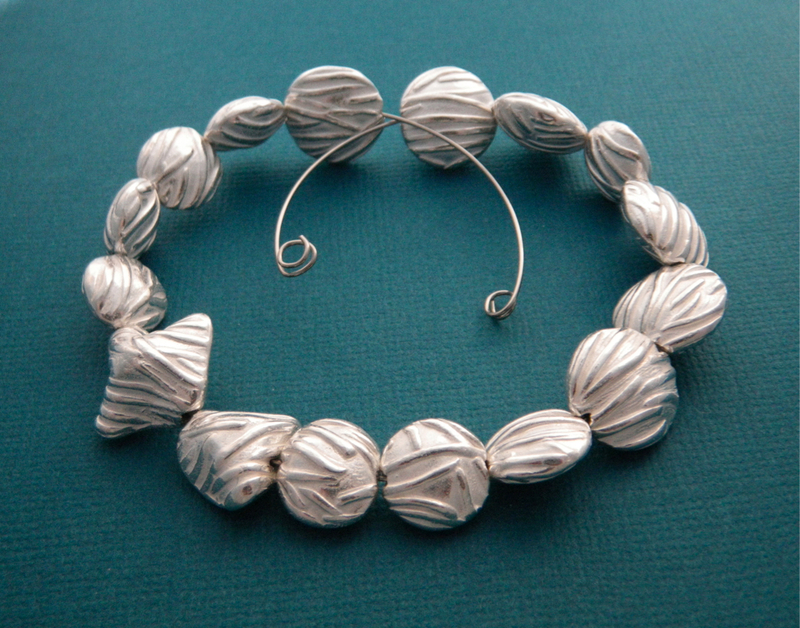 A round bead formed over a ball of wax, and two beads from the series I made for my entry to the Saul Bell Design Competition in 2006. 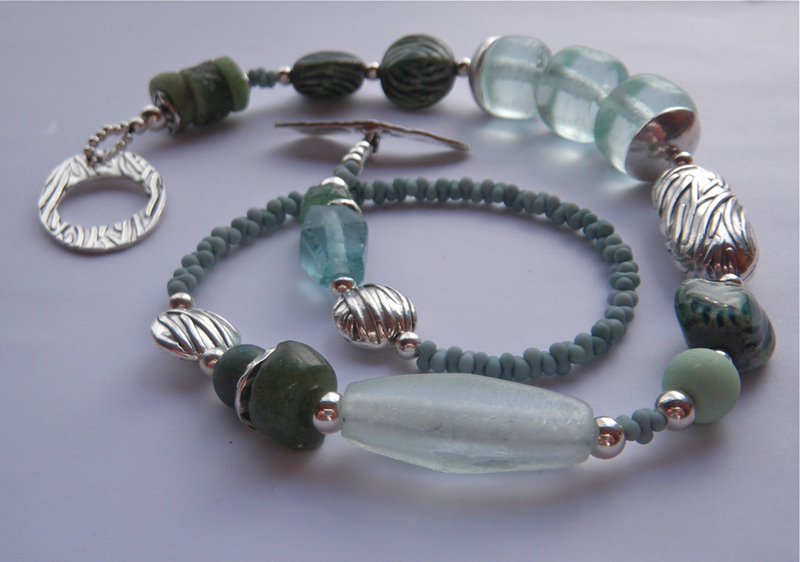 Making beads is one of my most favorite things to do! 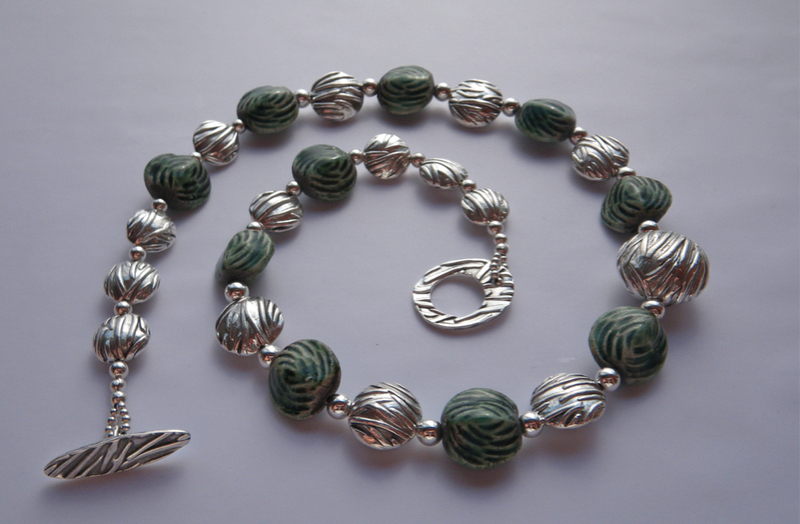 A while back I started a batch of fine silver PMC beads to pair with green raku beads made by Keith O’Connor that I picked up at the Beadin’ Path in Freeport in January. 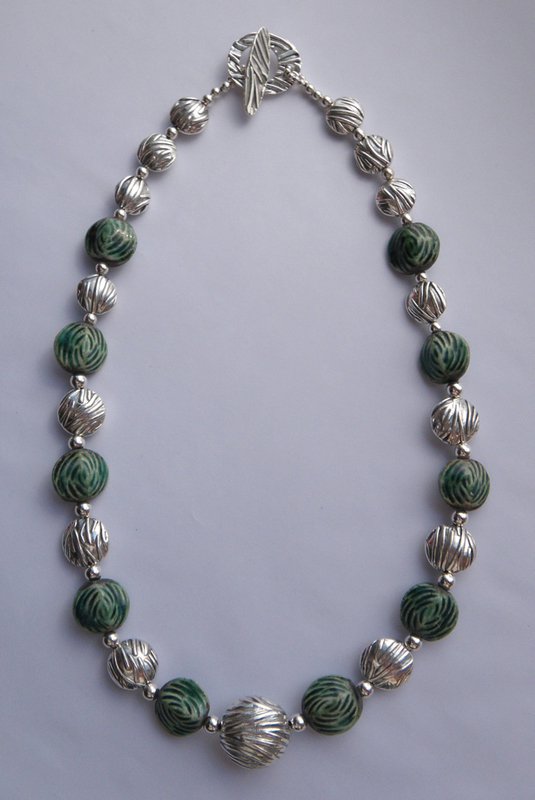 I alternated the silver and raku beads in a symmetrical necklace, about 18″ long. 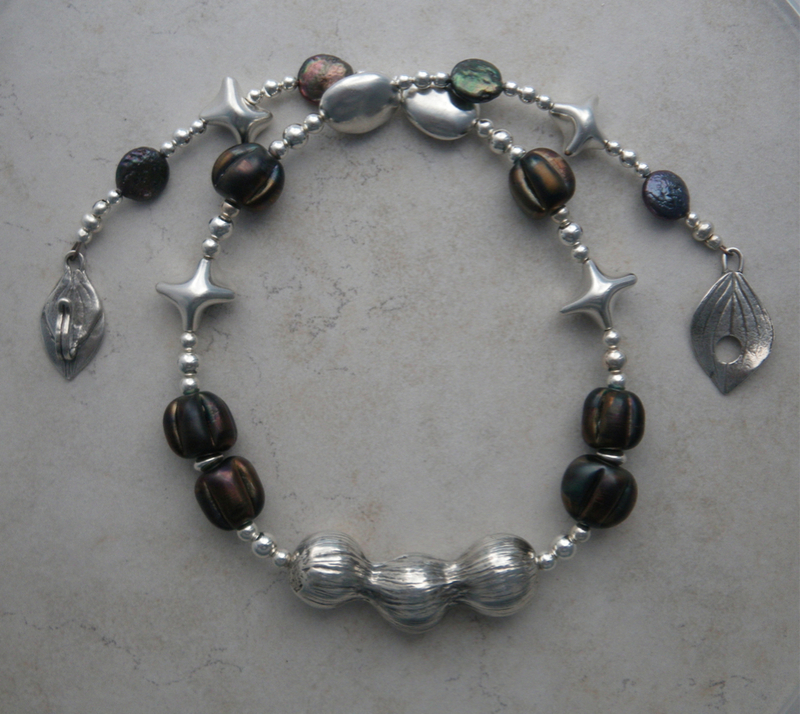 I had only three of Keith’s beads remaining, which made me stretch to come up with a way to use them. I didn’t want to make earrings and end up with a solo bead that had no place to go. 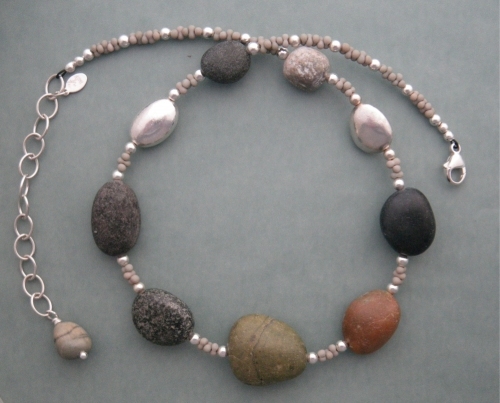 So I looked for beads to combine to make an asymmetrical necklace. I think I ended up with an interesting combination. 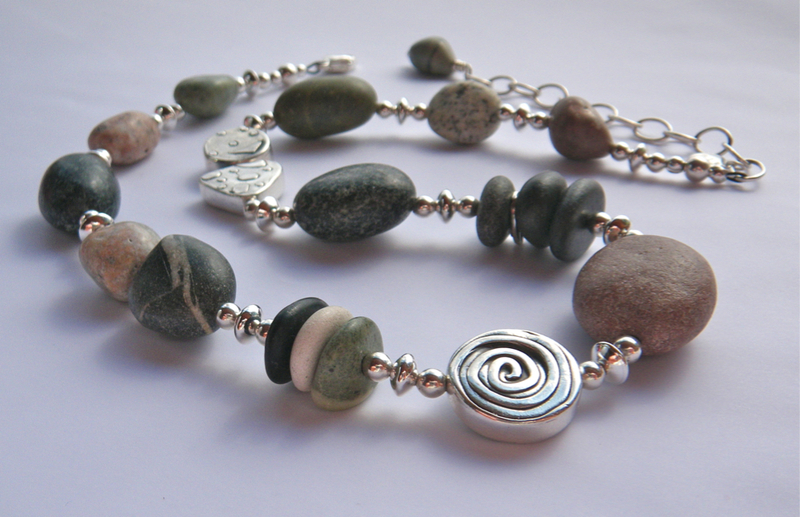 This kind of necklace takes me much longer to make, but I always have a blast doing it.